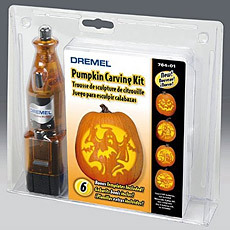 The Dremel Pumpkin Kit | OhGizmo! How can you increase sales of a product without adding an iota of new functionality to it? Simple: hijack an upcoming Holiday and “re-purpose” your product for the occasion. In this case, we have good ole Dremel getting into the business of selling a special Halloween pumpkin-carving package. For $30 you get the Dremel tool, plus a set of intricate patterns from which to carve funkalicious Halloween pumpkins. Check out the website. Story VIA Dremel.